Lizzy is the first British athlete ever to successfully defend a Winter Olympics title. 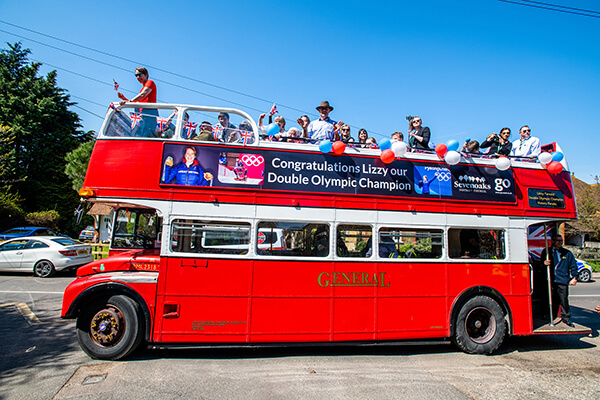 On her return home after winning her first gold medal at Sochi 2014, The Print Studio were involved in decorating the bus for the Council organised victory tour around the District, so when she created history earlier this year with a second win, Sevenoaks District Council immediately started preparations for a second victory parade. Their task was to decorate the vintage, open-top Routemaster bus that would take Lizzy around the District. Rather than drape banners down the side of the bus, they decided to make use of the existing advertising spaces. Graham Upton, manager of The Print Studio, explained that they were already familiar with much of the Antalis product range, and knew from experience the products that would work best. The Print Studio’s in-house design department measured up the areas of the bus to be decorated. They decided that Foamalite Xpress, a lightweight foam PVC with an ultra-white shade and a smooth matt finish, would be the ideal product for the large advertising panels on the side of the bus. It’s a product they are familiar with as they use it to produce temporary signage for carparks among other things. Although Foamalite Xpress is printable, The Print Studio opted instead to mount it with printed Orajet 3164 Gloss PVC. Coala Standard Laminated Frontlit Banner 440gsm Banner was used to create a banner that hung in front of the front window of the top deck of the bus. They also made the most of the ‘destination’ panels on the front of the bus, using Coala Solvent Satin Poster Paper to produce the authentic-looking black and gold signs with the correct London Transport font. Print: The Orajet 3164 Gloss PVC and Coala Solvent Satin Poster Paper were printed using The Print Studio’s Roland VersaCAMM sp540i wide format eco-solvent printer. Cutting: All the pieces were hand cut. Tip: Graham’s advice for anyone doing a similar project is: “Don’t forget to take a sharp knife, a cutting mat and ruler along to the site!”. 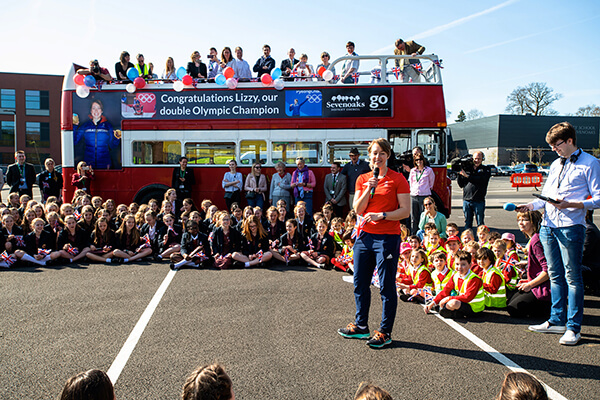 The bus was dressed over a period of two days, ready for Lizzy Yarnold’s victory parade, which took place on Wednesday, 18th April, and was seen by approximately 5,000 people along the 33 mile route. Graham Upton was delighted with the finished result and proud of the efforts of all of his team.